It is an interesting approach – choosing “active” devices that are not older than 2-3 years. Makes sense, as most of us would have a chance to switch their devices on this schedule. At the same time the chart for 2 vs. 3 years are not that much different (except for Symbian) – so why show both? 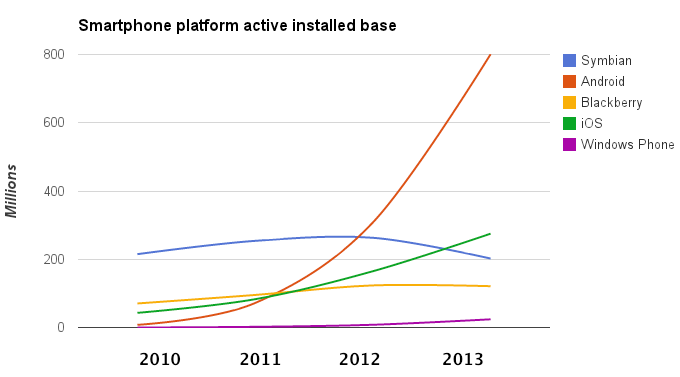 The title seems misleading – “WP to overtake” is to indicate that Windows Phone may be the 3rd platform in 2014. And it not only would have to overtake BlackBerry, but Symbian too. Is WP really going to be the 3rd platform? Indeed seems to depend on weak BB10 numbers. Does not seem like the best perspective for Microsoft – relying on BlackBerry doing bad means that Windows Phone may not be strong enough platform to perform on its own. “data compiled from Gartner, IDC and Canalys” – would be great to have more concrete data. How it was calculated etc. “Windows Phone, by far the newest mobile OS” – do we mean here that WP7 was not a continuation of Windows Mobile?